Housing and land-use regulation are the biggest factors in affordability; those are responsibility of provincial, regional and municipal governments. There's little the federal government can do to improve housing affordability. Learn more. CCEC has partnered with DOXA as a screening partner for PUSH, a global view on the housing crisis. So the benefits of the recently announced federal government’s measures will be modest. For example, the increased RRSP withdrawal is equal to only six months of the average house-price increase since 2000. Between 2000 and 2015, average house prices increased about three times the increase rate of incomes. The shared-equity mortgages, for example, would be available only to first-time-buyer households with annual incomes under $120,000. The CMHC mortgage limitation would further restrict the maximum mortgages to $480,000. Shared-equity mortgages are not very effective in Vancouver where most house prices are too costly for a $480,000 mortgage. Yet the housing affordability crisis is serious. Vancouver ranked as the second-least affordable among 90 major metropolitan areas in nine nations in the latest Demographia International Housing Affordability Survey(released in Canada by the Frontier Centre for Public Policy), trailing only Hong Kong. The Vancouver housing-affordability crisis has also developed as our City Government has developed some of the most restrictive land-use policies in the high-income world. With our local urban-containment policy, denser, high-rise housing offers virtually no help. In Vancouver, condominium prices are nearly equal to detached house prices 10 years ago. This does not take into consideration the smaller size of condominiums compared to houses. Moreover high-rise condominiums provide no yards in which children can play, which makes them less family-friendly. The average detached house in Vancouver averages about $1.5 million. Cities including Victoria and Kelowna now show average house prices equaling the $1 million in Toronto. Solving Canada’s housing affordability crisis will require provincial, regional and municipal action. It must start with addressing the price of land, which is the proximate cause of both the housing affordability and cost-of-living crises. 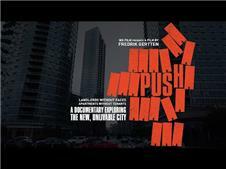 CCEC is pleased to partner with DOXA as a screening partner for PUSH, a global view on the housing crisis.